Should you give your kids access to Spotify? I have kept a track of the music I listen to for the last few years, ever since my wife convinced me to put my CD collection in the loft. It felt like a big move, “But darling, my CD collections defines who I am,” I protested. “They’re only pieces of plastic, Andy, “ she said. So up to the attice they went. The great thing is I now get to see what I’ve listened to over time. I have set up all the digital music channels I use (Spotify, Google Music, YouTube) to scrobble the data to last.fm. You can see my profile here. However, in December 2013, I let my 7 yr old daughter Beatrice use my Spotify account. My once pure listening history is now filled with Disney music, as you can see in the image above and the interactive story below. If you scrobble your listening history to last.fm you can download your own data. My good friend Ben Foxall (@benjaminbenben) has kindly put together a web form allowing you to get your data as a CSV file. 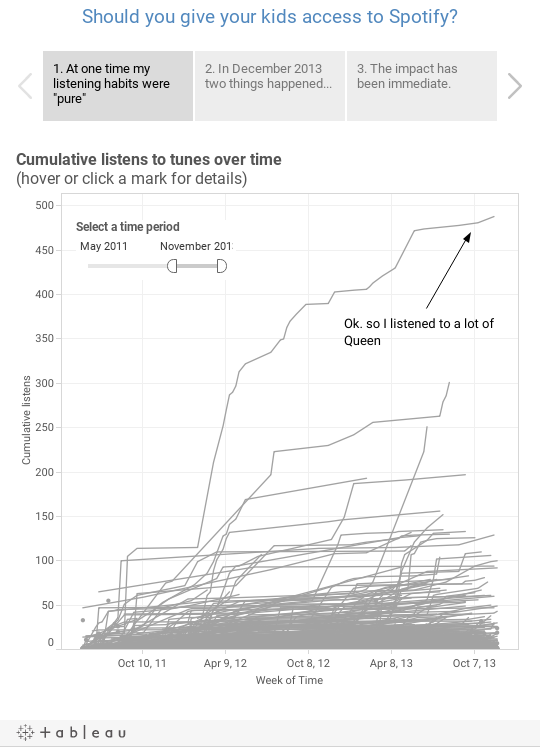 I’ve done much more last.fm listening history analysis, too, which you can find on my personal blog, gravyanecdote.com.